Pant played just one substantial inning in the last 6 matches. 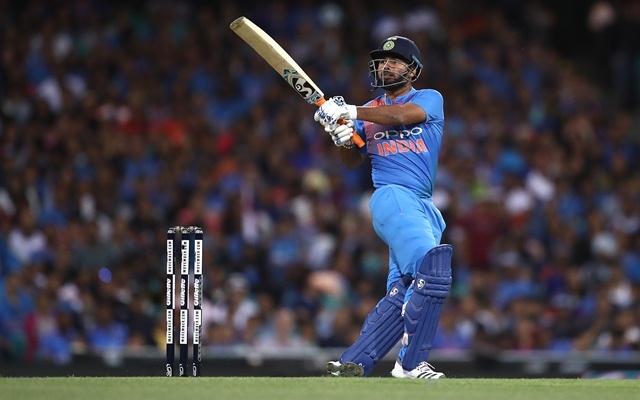 In the third Australia vs India T20I at the Sydney Cricket Ground, Rishabh Pant achieved a record, it isn’t a record he will be proud of or even talk about. When Pant walked out to bat and got out for a duck, he became the first Indian wicketkeeper to get out for a golden duck in T20Is. The youngster was picked for this tour ahead of MS Dhoni and clearly didn’t manage to create an impact. The national selectors looking at the future prospects wanted to give Pant and Dinesh Karthik more opportunities in T20s especially since Dhoni wouldn’t be around for the T20 World Cup 2020. The veteran was not picked in the team for the three matches against Windies and also on the tour of Australia. Pant scored 1 and 5 in the first two games against Windies, just when the pressure was building up, he responded with a half century in the last match. In the first T20I in Australia, the 20-year-old had a magnificent partnership with Dinesh Karthik but played a false shot at a very crucial juncture in the game. He got out on 20 and thereafter the Indian team lost the plot in the chase and fell 4 runs short of the target. At the SCG on Sunday, he walked in to bat at no.5 when KL Rahul got out. The Indian team still had some distance to travel, skipper Virat Kohli was there at the other end, batting as well as he does. On the very first ball from Andrew Tye, Pant made a wrong judgement. It was a slower bouncer outside the leg-stump. He tried to hit it towards fine-leg for a boundary but only managed to glove it. The ball lobbed in the air and wicketkeeper Alex Cary didn’t even need to move. Fans were really disappointed with Pant’s returns and felt that he failed the purpose he was picked in the team for. now, Who idiots want #Pant ahead of #Dhoni ? This man will remain kid and immature forever..
Bring back Dhoni!! #INDvAUS send back Pant. Consistent dhoni was always better than inconsistent Pant. Bring back Dhoni or play Ishan Kishan bass ye idiot Pant ko bahar nikalo!